I'll be in Paris in a little over a month. 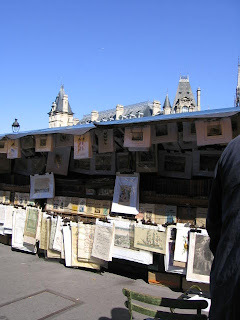 When I think about strolling along the Seine, browsing through the bouquinistes, my heart feels all happy. The only thing I like better than a bookstore is shopping for books at these second-hand book stalls in my favorite city. Naughty postcards...you can find them here. Antique maps...here as well. Prints, posters, lithographs...any subject you want. Books...but, of course. What treasures might I discover? Looking forward to hear of your discoveries. Will you look for something in particular? I'm doing a walking tour in Montparnasse on the writers of the "Lost Generation" so I think anything by or about any of those writers....Hemingway, F. Scott Fitzgerald, TS Eliot. Or maybe about one of the artists or models from the early 1900s...Man Ray, Kiki, Dali. Or maybe a naughty postcard or two! Who knows?